When I Initiated this project, files were organized for each of our Parent’s families. I then began reading about the process of genealogical research. In addition, various places that might provide needed information were visited. Through the on-line computer service Prodigy, communication with a Finland interest group was established. In addition, information from various agencies and organizations that maintain demographic records were contacted. The year 1992 was early in the developmental stages of the Internet and my son, Evan, introduced Prodigy on-line services to him. Evan’s wife Teresa worked for Prodigy and enrolled Wes as a part of their family (free). Over the years the Hakanen’s left Prodigy and accessed other services as they became available, trying to stay current with the times. The World Wide Web and the Internet have become invaluable tools to this research. Advancements in technology and the over-whelming interest in genealogy have provided a continuous stream of available information on-line. 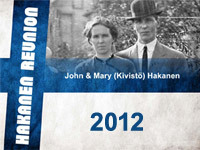 Through the Prodigy connection it was learned that the Lutheran Church, the official church of Finland, is responsible for maintaining Finland’s vital records. The various Finnish Parishes provided valuable research assistance over the first few years of the project. Other places visited during those early years were: the libraries at the Church of Latter Day Saints; the various historical societies, and numerous County Libraries. The State Library in Harrisburg, the Hillman Library in Pittsburgh, graveyards and courthouses in several counties and many other places where information could possibly be found were also visited. Once the genealogy bug bites you, research possibilities surface wherever you go. As previously mentioned, the Internet has grown to be an invaluable research tool and interest in genealogy has exploded over the years. E-mail contacts continue to expand and new information continues to be discovered and added. We have organized the information within the following pages.